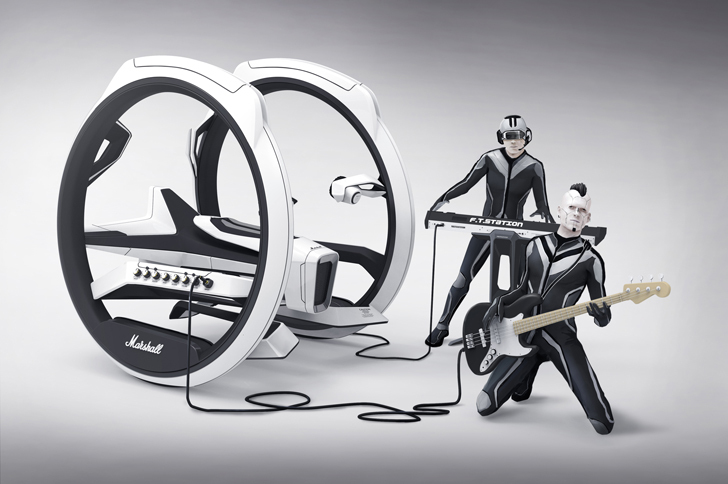 If Daft Punk had the makers of TRON: Legacy design a vehicle, it would probably look a lot like the Marshall Dicycle. This sleek electric motorcycle is the brainchild of Yuhan Zhang, a student at the Umea University of Design, and it doubles as a powerful sound amplifier. Perfect for a traveling music duo, the prototype vehicle is a fun-looking futuristic design made for pop-up concerts. Yuhan Zhang’s prototype was created for the Marshall brand of music amplifiers – one of the oldest and most famous manufacturers of audio equipment. Zhang’s main idea was to create a multipurpose vehicle that would convey the brand’s cutting-edge design and function. The dicycle combines all-electric transportation with new sound technologies to offer musicians a chance to – literally – take their show on the road. The vehicle has enough room for two people, features a luggage space under the seat for musical instruments, and offers an optional curtain up top. All the knobs and buttons necessary for the performance are located at the outer edge of the seat. Yuhan Zhang's prototype was created for the Marshall brand of music amplifiers – one of the oldest and most famous manufacturers of audio equipment. Zhang's main goal was to create a multipurpose vehicle that would convey the brand's cutting-edge design and function. The dicycle combines all-electric transportation with new sound technologies. It was designed to offer musicians a chance to - literally - take their show on the road. The vehicle has enough room for two people. It features luggage space under the seat for musical instruments and offers an optional curtain up top. All the knobs and buttons necessary for the performance are located at the outer edge of the seat.